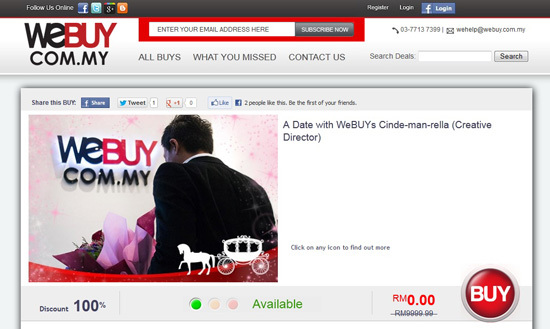 [April Fool #1] Groupon and WeBuy Malaysia are playing April Fool with You! Wow, Groupon Malaysia enjoyed to help the Groupon Customers who used this groupon voucher to fool their friends and family! 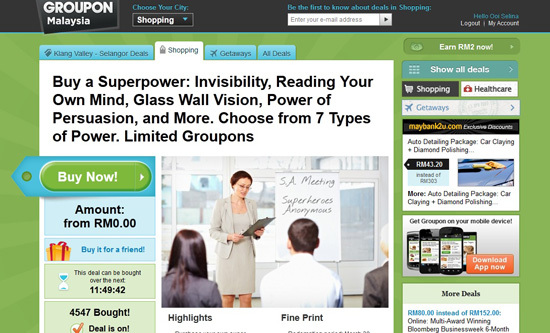 I also click on this groupon April Fool to support and want to make my friend to see my gift vouchers too! Haha. It is very good idea to make you to become superhuman if you want to buy the powers: Invisibility, Reading Your Own Mind, Glass Wall Vision, Power of Persuasion and more...! I choose my own power; Invisibility and Glass Wall Vision, to fool my best friends! :D They cannot find me at anywhere! So fun!